Windows 3.1 Operating System Seemed to function normally, started up and closed allright. Conclusion: Luckily for the computer, Y2K had no effect. Although this experiment only demonstrates that Y2K had no effect in this circumstance, Scientific AmeriKen feels as though it is safe to assume that a majority of computers will have similar results. 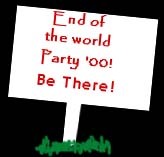 However, even though these results provide some evidence that the event of something drastic happening on Y2K is unlikely, Scientific AmeriKen will not be afraid to participate in any riots and or chaos that might occur as the world enters into the new era.